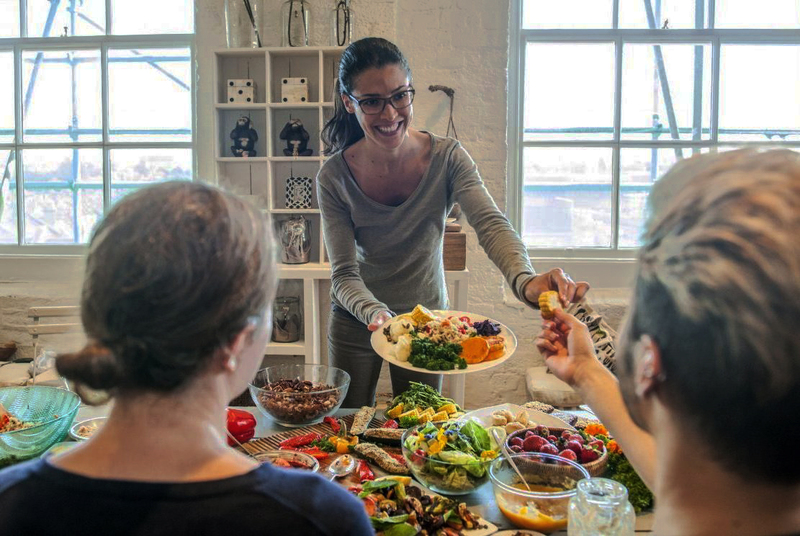 It is good news that people are becoming more conscious about food – choosing to eat more plant-based foods, buying organic ingredients and taking the time to cook from scratch. And when we put this care into preparing meals, it makes sense to put the same amount of love and care into the actual eating part of it! We often feel that we need to hurry our meals, but by taking our time and eating in a mindful way we will receive the full benefit of the food and we will feel good after we have eaten. It is good to be relaxed and calm when we eat, as this helps us to digest our food well. We spend a relatively small part of our day actually eating, so let’s remember that this is the important time when we are nourishing our bodies! Savour and relish each mouthful and enjoy the pleasure of eating delicious food! It is better to eat two or three meals each day rather than lots of small ones. It takes time to digest food (around three hours) and our digestive system needs to rest between each meal – if we are in the habit of constantly “grazing” throughout the day then we are making a lot of work for our digestive system, which becomes tired and less efficient, leading to lower energy levels and poor health. As well, eating balanced meals regularly helps to maintain steady blood sugar levels. When we sit down we are resting, and when we eat sitting down our energy can move inward to the stomach and digestive system. When we are standing or moving about, the circulation is actively bringing blood to our extremities, and action hormones such as adrenaline are being released that are not helpful to the digestive process. Good chewing allows us to assimilate the nutrients in the food well – teeth break down fibre and as the saliva mixes with the food, the enzymes in it start to transform the carbohydrate. As healthy foods like grains, vegetables and beans are high in fibre and complex carbohydrate it is important to chew well. Putting the fork down between mouthfuls helps us not to rush. When we are utilising more nutrients by chewing well, we can feel full with smaller platefuls and waste less food. Whether you are eating on your own, or with others, prepare your eating space so that it is uncluttered and attractive. Making the food look great with colour and garnish makes the food more appetizing too. Mealtimes are a great opportunity to be together with family and friends sharing food and the stories of the day. This good energy nourishes our spirit! Give the devices and TV a break while you eat! If we let mealtimes be for just for eating then we can focus on doing it well, and meal times become small islands of rest and calm during the busy day! Taking a few moments before eating to think about where the food has come from, the many hands that helped to bring it to us, and the abundance of nature, can make us feel grateful and appreciative of our food. Acknowledging that we are alive because we eat food, and being thankful for it, can help us to feel that we are a part of nature, our planet and all life.